The next Amateur Station Licence Examination will be held on Thursday 9th May 2019 in the ComReg offices in Dublin and at other centres if warranted by the numbers. The closing date for applications to sit this examination is Thursday 25th April 2019. Places for examinations at the ComReg Offices are limited, they are allocated on a first come first served basis and are only reserved on receipt of an application form and the examination fee. Download the application form here. The exam fee is €50 or €25 for full-time registered students, repeat candidates and those who are retired, unemployed or have a disability. Payment may be made by credit card or PayPal using our online payments system. Alternatively, Cheques or Money Orders payable to IRTS may be sent to the address above. N.B. A completed application form must be submitted and payment must be made before a candidate can reserve a place for the exam. Intending candidates should note that anyone who fails to produce a photo identity on the day of the examination will not be allowed to sit the examination. The photo ID can be a driving licence, a passport, an employment photo identity card or a student card containing a photograph. A national Garda photo ID is also acceptable. 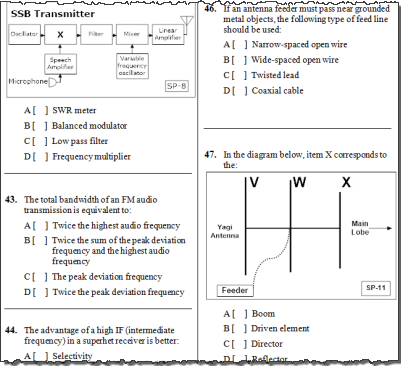 The examination consists of a question paper of 60 multiple-choice questions divided into two main sections; the first section focuses on regulations and related issues, the second section covers the theory side of amateur radio. The time allowed is two hours. The pass mark is 60% and a pass is required in each of the two main sections of the paper. Under an agreement with ComReg, IRTS is responsible for setting, organising and correcting the theory examination. The examination is usually held in the ComReg Offices in Dublin but, where the numbers warrant it, examinations can be held at other centres. Examinations are held twice yearly, in May / June and November / December.